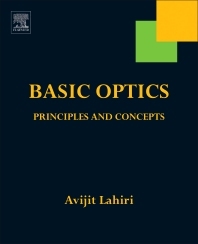 Basic Optics: Principles and Concepts addresses in great detail the basic principles of the science of optics, and their related concepts. The book provides a lucid and coherent presentation of an extensive range of concepts from the field of optics, which is of central relevance to several broad areas of science, including physics, chemistry, and biology. With its extensive range of discourse, the book’s content arms scientists and students with knowledge of the essential concepts of classical and modern optics. It can be used as a reference book and also as a supplementary text by students at college and university levels and will, at the same time, be of considerable use to researchers and teachers. The book is composed of nine chapters and includes a great deal of material not covered in many of the more well-known textbooks on the subject. The science of optics has undergone major changes in the last fifty years because of developments in the areas of the optics of metamaterials, Fourier optics, statistical optics, quantum optics, and nonlinear optics, all of which find their place in this book, with a clear presentation of their basic principles. Even the more traditional areas of ray optics and wave optics are elaborated within the framework of electromagnetic theory, at a level more fundamental than what one finds in many of the currently available textbooks. Thus, the eikonal approximation leading to ray optics, the Lagrangian and Hamiltonian formulations of ray optics, the quantum theoretic interpretation of interference, the vector and dyadic diffraction theories, the geometrical theory of diffraction, and similar other topics of basic relevance are presented in clear terms. The presentation is lucid and elegant, capturing the essential magic and charm of physics. All this taken together makes the book a unique text, of major contemporary relevance, in the field of optics. Avijit Lahiri is a well-known researcher, teacher, and author, with publications in several areas of physics, and with a broad range of current interests, including physics and the philosophy of science. Professor Avijit Lahiri obtained his Ph.D. from Calcutta University in 1975. He was engaged in teaching physics and research over a long period of 36 years. He published work in several areas of theoretical physics in international peer reviewed journals, including those published by Elsevier. He lectured widely on numerous topics in physics and mathematics, both to a general audience and to specialists. For the last fifteen years he devoted himself to book writing and authored five books.